Jobu and Lou Brown come together to form Hats for Bats, a tag team with it’s eyes on taking the Bruins’ Tim Thomas down a peg. To be perfectly clear, Tim Thomas is entitled to his own opinions, but he is not entitled to his own facts. In his statement, Thomas bemoaned what he perceived as a Federal government that has lost its way and now threatens the “Rights, Liberties, and Property” of American citizens. Although he is neither a Constitutional nor an Early Republic scholar (Thomas majored in English at the University of Vermont), he believes, without providing evidence, that today’s federal government violates the US Constitution and the “Founding Fathers [sic] vision.” Somehow, in Tim Thomas’s world, the United States government is just horrible and it is something that he simply cannot support in good conscience. Being honored, along with his teammates, at the White House, would somehow undermine his sense of patriotism. Since Thomas was an English major, he certainly understands literary concepts of hypocrisy and conundrum. For example, Thomas’s protest on Monday contradicts his own actions in the past: he had no problem representing his country in 2010 at the Olympics in Vancouver. Thomas also displays the common libertarian paradox of unadulterated freedom. Yes, Thomas has the same freedoms enjoyed by every private citizen in the United States. However, in this instance, he’s not a “Free Citizen.” He’s a corporate citizen of his employer: the Boston Bruins. He was asked by his employer to attend and he refused. This reflects poorly as much on Thomas as it does his employer. The Bruins should suspend Thomas for actions detrimental to the team (never mind the NHL), but they won’t (GM Peter Chiarelli said the event wasn’t mandatory, as they knew in advance Thomas would refuse to go and they don’t want to upset their star). After all, being a good guy at sports allows one to engage in acts of self-centered childishness not tolerated anywhere else in the real world (see: Dorn, Roger). Tim Thomas has enjoyed every benefit of the American Dream. He got his college education paid for by the tax payers of Vermont. He makes millions of dollars playing hockey for a living. He has worked hard for everything he has obtained and deserves all of it. Moreover, Thomas is right about one thing: the federal government is greatly flawed. Nevertheless, it isn’t the Orwellian dystopian nightmare he envisions. Like it or not, the federal government works within the framework of the Constitution. If you don’t like it, amend the Constitution (there’s a process for that). Otherwise, leave the bomb-throwing to the regular politicians (it’s what they do best). Monday’s ceremony was supposed to be a celebration of teamwork. That is, until Thomas’s delusional ego-centrism got the best of him. If life is so bad in the USA, perhaps Thomas should consider a return to Finland, or maybe working 12 hour days to assemble iPhones for $17 a day in China. Yes, Tim, the Federal Government is the one that’s out of control. How about you focus on “getting in front of the damn puck” and leave your distorted world view in fantasy land where it belongs. 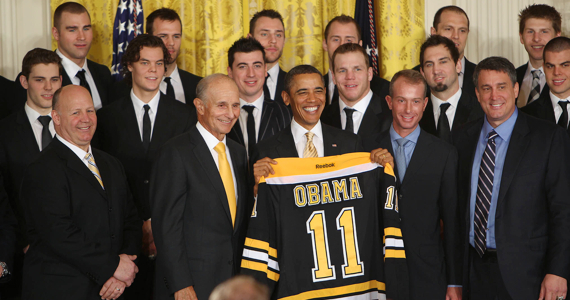 The next time you win the Stanley Cup and the President of the United States invites to to the White House to shake his (or her) hand, you swallow your pride and say yes. Tim Thomas is politically inclined and involved. That’s a rarity in sports, and I support him for it. Most professional athletes only talk in cookie-cutter sentences designed to sell cereal boxes and subway sandwiches, so it’s actually refreshing to see that Thomas has another passion and is dedicated to a meaningful cause. The problem I have with what Tim Thomas did on Monday is that he chose an inappropriate time to express his views, which is a problem often shared by politically extreme loons (whichever direction their views lean). I don’t like smelly protestors trapping me on Third Ave when I’m trying to get food on my lunch break, I don’t like actors who share political views while accepting Academy Awards and I don’t like athletes who share their political views during sporting events. The White House visit has been a tradition in American sports since 1865 (a baseball team from Brooklyn named the Atlantics visited Andrew Johnson just four months after Lincoln’s assassination). It is an absolute honor to be invited there, not just because the President makes a few jokes and shakes some hands, but because of what the visit represents. If you win the championship, you go to the White House. By doing so, you honor the fans who cheered you on, your teammates (who all went… even the foreign ones), the front office people who pay you your millions and every president who has ever invited a championship to visit them (even the icky ones you don’t like, Tim). By not going, you disrespect all of those people (and you spit in Delonte West’s crazy face). I feel like Thomas is getting a lot of praise because he’s an athlete, and everyone’s surprised all his energy isn’t going to lifting weights, banging chicks, watching cartoons, drinking beer, burping contests, pooing in opponents’ gloves, fighting in clubs or creating other general mayhem (especially being a hockey player). It’s ok for athletes to be smart and informed, we don’t have to give them a nobel prize every time one of them says something smart. Also, let’s not get this twisted. 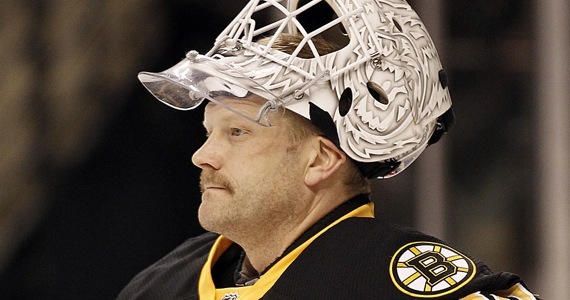 Tim Thomas isn’t a martyr for his cause. He’s not Muhammed Ali vacating his championship and giving up three prime years of his boxing career so that he didn’t have to go to Vietnam. Ali did not want to go to a foreign land to kill a people he said had never done anything to him. Tim Thomas just didn’t want to shake Barack Obama’s hand… let’s get him down of the cross. Look, I don’t ever want to criticize someone for standing up to speak, but have you ever noticed when someone with extreme political views (or any kind of extreme views) starts talking on the subway, everyone rolls their eyes and turns up their headphones? It’s because there’s a time and place for talking about politics. It’s not on the subway, and this time, and this is probably the only time I’ll ever feel this way, it wasn’t at the White House. Also, don’t be a baby about it. Your guy lost. Don’t take your ball and go home (resisting…rant…about…political…extremists). Use your newfound celebrity as a world champion and Stanley Cup Finals MVP to spread your political views in the appropriate channels, like political rallies, caucuses, debates, or political conventions. Leave sports out of it. I still think that James Harrison takes the prize. In ’09 he refused to go because the only reason President Obama had invited the Steelers was because they had won the Super Bowl, and that they wouldn’t have been invited if they had lost. Really, James? Is that how it works? I’m not sure Thomas is in his correct mind to start out with. When asked which historical figure he’d like to have dinner with if he could chose anyone, said Glen Beck. I think he confused historical with hysterical.